Napoleon Bonaparte’s surprise march placed his army squarely between Blucher’s Prussians at Ligny and Wellington’s Anglo-Allied army assembling around Brussels. Napoleon concentrated most of his strength against Blucher, but ordered Ney and the II Corps to capture the vital crossroads of Quatre Bras to deny Wellington the chance to reinforce Blucher. Ney procrastinated and his attack did not get underway until two in the afternoon. The delay allowed Wellington to bring fresh allied troops to support the Dutch-Belgians and the Nassau Brigade that were thinly deployed south of the crossroads. The initial French advance was greeted with musket volleys, but the outnumbered Allied troops were forced back. The Allied units in the wood, however, managed to hold. 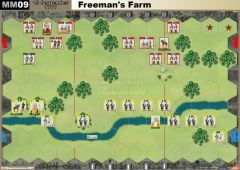 Facing three infantry divisions and a cavalry brigade, the Allied situation was fast becoming desperate, but additional troops kept arriving and Wellington, now in command, directed them to key positions on the battlefield. 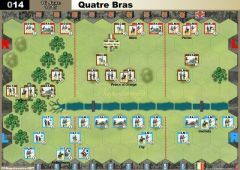 Ney realized that the numerical balance was shifting in favor of the Anglo-Allies and that he could only capture and hold Quatre Bras by a desperate move. He ordered General Kellermann to lead his cuirassier brigades forward and break through Wellington’s line. The cuirassiers managed to reach the crossroads, but were driven back by close range artillery and musket fire. 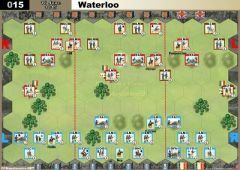 The arrival of the British Guards Division late in the day gave Wellington sufficient strength to launch a counter-attack that forced the French to give up all of their hard fought territorial gains. The entire stream is fordable. 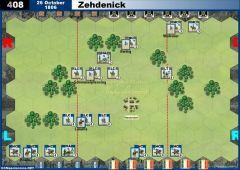 In addition, a unit or leader’s movement is not stopped when moving onto a stream hex. Good analysis. The GG in the woods are indeed almoast unbeatable in the forest unless you can use the lights to put a dent into them before they retaliate. If you manage to hurt the french lights with the allied forces, the french lose their offensive capabilities on that flank. Yes, in both our games, the Dutch moved behind the centre hills pretty quickly. Both of our QB games that were played these last two weeks or so have been decided by the results of the French cavalry. If the Cuirassiers can be saved and used for an almighty punch in a weakened area, they can really grab some useful banners (against Dutch light cavalry and artillery batteries). The light cavalry can support them too by pinning down nearby enemy infantry in square. We have also found that the fighting around the Bossu woods is quite intriguing and both players have had to manage their resources in that area. 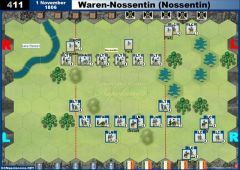 The Grenadier Guards are of course useful here, but then again, the French player can nab an advantge if he can bring his light infantry to come down on them (as they can battle after moving in woods but the Guards cannot) before they suffer any significant losses. This is a good scenario with both sides able to win it. 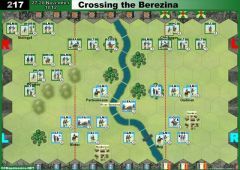 I believe key to winning as the British/allied is withdrawing your allied infantry on the first turn, behind the center hills. If you don't do this, french double cannon can just blast your infantry to death. Or they can wait for a double move card with their infantry and kill you off that way. It's just too easy for them to kill your main central force if you don't withdraw them. The British flanks are pretty well defended. On the left the RL + cannon make it a deathwish for an infantry advance, and on the right a single GG in the forest stops whatever french units have left after killing the allied forest force. 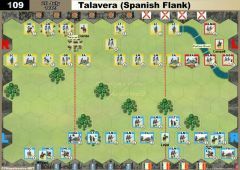 With strong flanks and a center that falls back, french central advance can be harassed from the flanks. Making it a dangerous business. All in all very well balanced scenario. But I do feel that if you play as the french are you are extremely patient, you can not really lose. And with that I mean waiting and waiting untill the good cards are available. 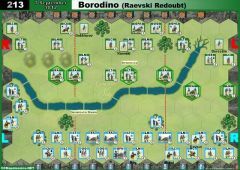 Since France has much more troops, and are in better defensive positions, you can afford to wait for good cards. Brits can't attack much unless they want to lose fast. Well I played this one twice over Skype and VASSAL with my mate Tony Reynolds from Belgium. As the Allies I lost 7-9. 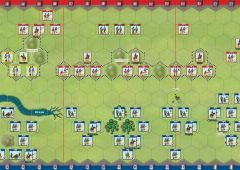 My start was assisted with a Grand Manouvre card that got my British units up quick, but despite that, Tony played a canny game with his Frenchmen and ran out the 9-7 winner in a tense, close finish that featured a lot around Le bois du Bossu in the latter turns. The French curraissiers carrying the win for Tony. In the re-match played yesterday, it was my turn as the French, and this time, the day was carried once more for the Frenchmen as I won this time 9-5. The British did not get forward fast enough and the Dutch-Belgians and Brunswickers had to take the brunt of the French attack. This came mainly in the centre with the French Cavalry carrying the day JUST!! They had almost run out of gas before they got the last two banners which included occupying Quatre Bras. British won with 9:8. French opened the battle with the bayonet charge against Dutch troops in the woods. The attack was successfull and only artillery survived. 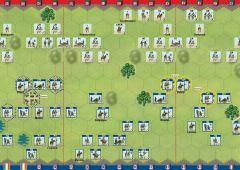 Wellington intervened with his light cavalry but French cavalry countercharge destroyed the opposing cavalry and inflicted serious losses to Allied infantry. Dutch artillery in the woods repelled all the attacks on itself while in the meantime French artillery in the centre cleared the ridge in front of itself. French cuirassiers attempted to destroy remnants of Dutch infrantry but was destroyed around Quatre Bras. The secon cuirassier attacked Dutch artillery on the ridge with the support of French artillery but failed to score with 14 dice. 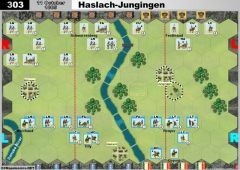 In the desperate counterattack Dutch light cavalry got four "horses" on four dice and the battle went towards Allies. British soon increased their lead to 7:4 with successful battles on their left flank. French refused to go down quietly and with some desperate infantry charges equalised the score on 8:8 but British played Elan and finished the battle. Game deciding moment was a failed charge by the allied infantry, who had initially withdrew behind the center hills. After the french advance they counter charged, but totally failed to put a dent into the french line. Rolling 4 vs 4 in melee against the french line, they did less damage with 4 units going first vs 3 french units. Also the flanks have some units who are in a real difficult position to use offensivly for the allied player. The RL on the left and the allied Line on the right for example. apergis1@verizon.net wrote: There should be two Allied (Portuguese) LC not one. Discovered error in the Battle Notes for this scenario. There should be two Allied (Portuguese) LC not one. Just finished playing six times at wargame club session. Three victories for French, three for British. their British sheet as normal. When this scenario refers to "Allied" troops, does it mean (as I suspect) the Dutch-Belgians (i.e. the forces allied to the British) or is it referring to all the troops (the Allies)?